Size: 397 sq.ft. - 1350 sq.ft. A modern styled residential project is being ready to deliver by the end of 2018. The project is known as Eaton Place by Ellington Developer of Dubai. After great success of Belgravia Tower 1 & Tower 2 in JVC community Ellington Properties is ready to present "Eaton Place" in the same location due to the huge demand of properties around the JVC area. Jumeirah Village Circle district 15 is developed by Ellington Developer.The building contains mid-range studios and one- and two-bedroom apartments. The apartments of Eaton Place start at AED 440,000. Eaton Place is a five-storey residential building containing top-notch homes of Studios to 2 BR apartments. 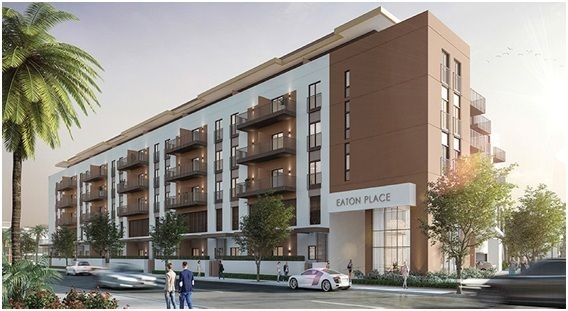 The project configuration of Eaton Place includes Ground+Podium+4 Floors with a wide balcony. The studios range in size from 397 to 400sq ft. The one-bedroom apartments range in size from 783 to 1200sq ft. The two-bedroom apartments range in size from 1130 to 1350sq ft. Facilities for residents include a resort style pool courtyard, garden area, children's play area and 24-hour security.Eaton Place has Exit point on Al Khail Street with retail stores,entertainment centres and restaurants with up to 350 shops & centres. The Circle Mall compromises of 200 Shops, Multi-screen Cinema, Supermarkets, Restaurants and a large lobby. Ellington Properties was established in 2014, since then the group has been shaping Dubai’s Communities by providing high quality residential community located in the areas of MBR City, Downtown Dubai, Palm Jumeirah, and Jumeirah Village Circle. The Group continues to introduce high-end township in Dubai featuring its latest developments such as high-rise luxury residences and multi-family communities. Ellington new projects include DT1 luxury apartments, Belgravia Heights 1, 2 & 3, Eaton Place, Somerset Mews, Wilton Terraces 1 and 2, and The Ellington Collection at the Palm Jumeirah. Their goal is to provide beautiful residential environments featuring classic yet contemporary and highly architect residences. Each home is crafted to perfection by recognizing all homeowners requirements and developing impeccable communities that offer remarkable lifestyle experience for everyone. The project "Eaton Place" is doubtless the beautifully landscaped central court.It is a land to enjoy fresh air and socialize with other residents. Eaton Place structured to server to the lifestyles of modern individuals and their families.The location itself provides on-site opportunities for fitness & recreation of residents. Residents can have the advantage of well-equipped gym and a lounge in the outdoor pool surrounded by lush greenery. For children the project has the outdoor play areas, a round the clock security and card access controls. This is a good opportunity to invest into a high quality development in Jumeirah Village Circle from the primary market. More upcoming routes are currently being established and plans for a new community club and an expansive shopping complex are on track so residents can expect further developments that will make living in JVC a lot more enjoyable and convenient. Eaton Place by Ellington Properties is located at Jumeirah Village Circle (JVC), Dubai, United Arab Emirates. Apart from Eaton Place stunning residences the building also provides well-equipped amenities like Concierge service, Security system, Children's play area, Healthcare clinics, Shopping mall, Courtyard, Covered parking, Card access control Fitness centre, Outdoor pool.